From June 10th 2018 until August 15th 2018, get the opportunity to discover the lavender fields from Marseille ! Departure from Marseille and drive to Aix en Provence. Take a stroll through one of the numerous markets taking place everyday in the center of the city and offering a shimmering palette of fragrance and colours. Don’t forget to take your camera in hand arriving on Valensole plateau ! You will pass by picturesque roads lined with golden wheat and blue lavender fields. The tour includes many photo stops on the way to Valensole and also free time to discover this traditional provencal village. Your guide will give you useful information about how to recognize the fine lavender, the use of lavender essential oil, and also about the lavender crop in Provence. ! Drive to Pays de Sault with its wide lavender and lavandin fields in bloom. Stop in Sault, “the capital of lavender”. Enjoy many photo stops in the lavender fields in bloom and visit a lavender producer. Free time in the charming village of Sault for lunch on your own (market every Wednesday). In the afternoon, discover two of the most beautiful villages in France. Roussillon is built at the top of an ochre cliff, and provides visitors with a beautiful understanding of the harmonious combination of man and nature, and of ochre and stone ; with all these ochre-washed façades. Gordes is a village erected on the top of a cliff, its fortified castle and church dominate the typical houses of the village which were built with stones from the rock on which they are fitting. Back to Marseille. From June 04th 2018 to August 15th, discover the lavender fields in bloom ! Meet your driver outside the hotel Jules César in Arles and get on the air-conditioned minibus. 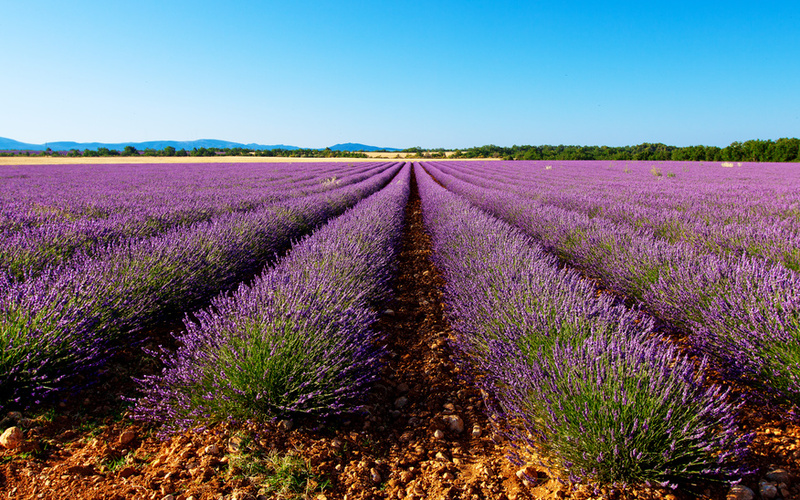 Drive along picturesque roads through wild lavender fields to Sault, the Lavender capital (photo stops) or Roussillon. Free time in Sault or Roussillon to wander and do shopping in lavender shops. You will appreciate the lavender : essence, flowers, honey… Free time for lunch (not included) on your own during the day. Drive to Gordes, perched village in Luberon, one of «the most beautiful villages in France» entirely stonebuilt. 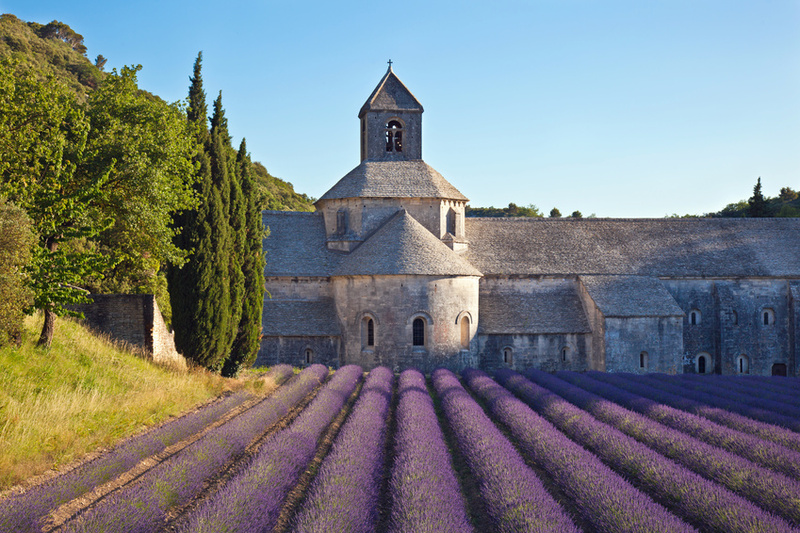 Between mid-June 15 and mid-July only, photo stop at Senanque abbey to take pictures of the blooming lavender field. Visit of the LAVENDER Museum (entrance ticket included) in Coustellet where you will find out the secrets of the lavender flower (video, exhibition, demonstration of distillation, shop). We are in the mid season of winter. The lavender fields are frozen. The farmers take this opportunity of ‘resting time’ to check and service their equipment. This is an introduction to one of the traditions in France; Candlemas is a one of the oldest Christian holidays also commemorating the Presentation of Jesus at the Temple on every 2nd of February. As mentioned in the bible at the 4th century AD, this event took place 40 days after the birth of Jesus on the 25th of December – Christmas. La Chandeleur in latin means ‘Festival of Candles’. In the tradition of the Catholics, Anglicans, Methodists and Lutherans, the priest blesses the candles brought by the faithfuls that will be used in their homes during the year. These lighting of candles not only symbolise the renewal of faith but also the Purity of the Blessed Virgin Mary. Customary, many Christians remove their Christmas decorations on the Twelth Night (Epiphany Eve). However, there are others that will remove them on Candlemas. Traditionally, all the candles should be lit in the house. It is also celebrated with crêpes – thin pancakes. Shaped round and golden colour, it is said to represent the solar disc symbolising the rebirth of nature precisely the return of Spring after the cold and dark Winter. Pope Gelasius I had ordered pancakes to be distributed to the pilgrims arriving in Rome. There are a few symbols related to the preparation of the crêpes. An old tradition linking to a fertility rite is to flip the crêpes in the air with the right hand while holding a gold coin (Louis d’or) or more commonly a normal coin in the left hand. If the pancake lands properly back in the pan, one will have prosperity throughout the year. The most superstitious will even place the first crêpe made in an armoire to ensure a good harvest and good luck for the year. More specifically if it is placed on the top of the armoire, and not get moldy ; that will keep misery far away. While the lavender fields are ‘resting’, November is the month of the season when the farmers take time to prepare the reproduction of the lavender. It can be done by the propagation of seeds or by cuttings depending on the species of the plant. The fine lavender (lavandula angustifolia) reproduces only by seedlings. Grains from the finest specimens are collected and are sowed in a specially prepared soil in the nursery just before the winter frosts set in. First technique: producers want to keep a homogeneous race secreting its own defenses. Either they collect the seeds from the whole plantation, or they choose from the best plants for reproduction, hoping to have the best qualities. A second technique is to pick up the fallen seeds on the ground of the distillery while loading the stills, which excludes any selection of seeds. These seeds will germinate and we will have to wait around 3 years before we can use these plants for a new plantation. Lavandine, a hybrid of lavender and aspic which produces 4 times more than the fine lavender. It is sterile, therefore, the propagation is done mainly by cuttings. During the autumn season, selected clumps are selected from the best quality plants from which hundreds of cuttings can be taken. They are prepared and stored in a well-ventilated and frost-free nursury. Come spring, in March, planting begins when the soil starts warming up, so that they might take root during the 12 months preceding transplantation. They are planted every 30cm and the rows are 1m50 apart. Depending on the soil type and climatic conditions, a young lavender plant can last from 8-10 years. Lavender season is over. We are now in September and it’s the turn of the grape-growers busy preparing for the grape-harvesting period in France which is between August and October. This is also a very important month for the winemakers as it’s one of the most crucial steps in the process of wine-making. Based on the style of wine they wish to produce, the wine-makers will determine the time of harvest by the ripeness of the grape as measured by sugar, acid and tanin levels. Weather conditions are also a very important factor. Threats of heat, rain, hail and frost can damage the grapes as well. In addition to determining the time of the harvest, wine-makers must also decide whether to use hand pickers or mechanical harvesters. However in some regions, the method of harvest and the grapes varieties used in the making of wine are mandated by rules. For example, in Châteauneuf-du-Pape, various rules for the production of Châteauneuf-du-Pape, were drawn up and promulgated in 1923, were the first Appellation Contrôlée rules in France, and provided the prototype for subsequent AOC rules. Here, only hand picking is allowed and grapes are transported in small containers. Minimum natural alcohol degree is 12.5%. Only 13 grapes varieties are authorised. 95% production of red wine and 5% of white wine, No rosé wine in Châteauneuf-du-Pape. The first producer of wine in France is Bordeaux and followed by the South of the Rhône River Valley. (Côte du Rhône), Last but not least is Burgundy region.